Geneva 2012: Aston Martin V12 Zagato | What Car? 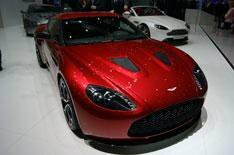 The Aston Martin V12 Zagato has been revealed at the 2012 Geneva motor show. First seen in May 2011, at the Villa D'Este Concours d'Elegance in Italy, the V12 Zagato is based on the V12 Vantage, but has a unique, handcrafted aluminium and carbonfibre body. The double-bubble roof hints at the iconic DB4GT Zagato, which celebrated its 50th anniversary in 2011. The V12 Zagato is powered by the same 6.0-litre V12 engine found in the Vantage, producing 510bhp and 420lb ft of torque. The flagship Aston Martin will cost 330,000, and is available to order now, ahead of first deliveries in the autumn. Just 150 will be made with each taking a staggering 2000 man-hours to produce.